As the first female leg amputee to complete the Ironman Triathlon World Championship in Hawaii, Sarah Reinertsen is no stranger to surmounting obstacles. Nike is giving her a boost, however, with a lightweight, durable composite sole that slides easily over her carbon-fiber running blade. Because options for prosthetic soles are limited, particularly for ersatz limbs that aren’t shaped like a human foot, Reinertsen had to cobble her own using the outsole of a traditional running shoe. The sportswear giant worked with both Reinersten and Össur, which manufactures the Flex-Run blade, to engineer the “Sole,” a shoe that offers a tighter grip, increased stability, and a more predictable advantage on the track. The Sole comprises an outsole, a midsole, and a thermoplastic urethane material (known as Aeroply) made of recycled Nike air bags. Nine nylon plastic tabs wrap tightly around the Flex-Run carbon fiber blade, providing not only a secure lockdown but also allow ease of removal. A stretch rubber leash with a tactile grip holds the entire shoe in place. The new Flex-Run with Nike Sole is available through prosthetists’ offices globally. Reinertsen was born with proximal femoral focal deficiency, a bone-growth disorder that resulted in an above-the-knee amputation when she was seven. Not that it’s held her back. 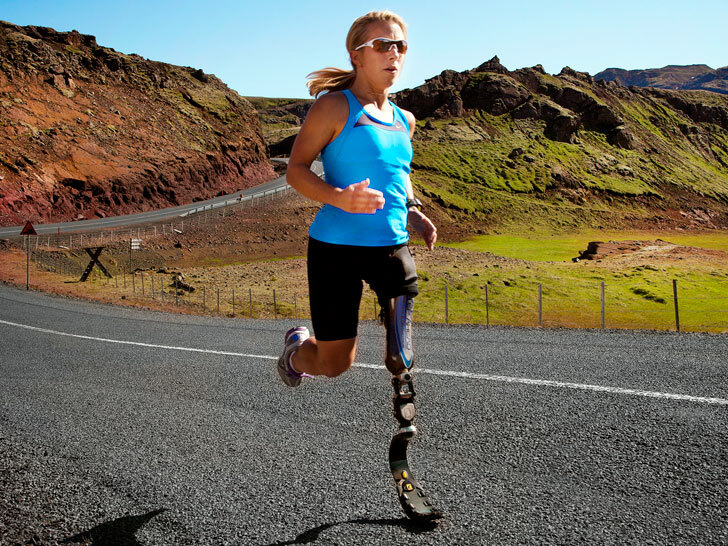 Following the amputation, she took up track and broke the 100-meter world record for female above-the-knee amputees at the age of 13. In 2005, she made headlines once more by completing the Ironman Triathlon World Championship. You don’t have to be an triathlete to get your hands on the Sole, however. The new Flex-Run with Nike Sole is available through prosthetists’ offices globally. As the first female leg amputee to complete the Ironman Triathlon World Championship in Hawaii, Sarah Reinertsen is no stranger to surmounting obstacles. Nike is giving her a boost, however, with a lightweight, durable composite sole that slides easily over her carbon-fiber running blade. Because options for prosthetic soles are limited, particularly for ersatz limbs that aren't shaped like a human foot, Reinertsen had to cobble her own using the outsole of a traditional running shoe. The sportswear giant worked with both Reinersten and �ssur, which manufactures the Flex-Run blade, to engineer the "Sole," a shoe that offers a tighter grip, increased stability, and a more predictable advantage on the track.